The Clothesline gives disadvantaged kids access to quality merch. Ellen Moy at The Clothesline for Kids. Photo by Dixie Vereen. “This is not a thrift store. This is the good stuff,” says Ellen Moy. She’s standing in the middle of her recently launched nonprofit, The Clothesline for Kids, on North Pershing Drive. The Arlington mom, who has a background in retail merchandising—including a stint with D.C.’s beloved Commander Salamander—founded The Clothesline with her husband, Ben Sessions, after realizing it wasn’t that easy to pass along their two sons’ gently used clothing to families in need. “We used to work with teachers…but it became harder as the kids got older,” says Moy. Sometimes it was awkward for students to receive hand-me-downs from other students at their school. “I wanted somewhere to donate clothes where kids could get them immediately and never had to pay for them,” she says. Studies have shown that children are less likely to miss school when they have clean clothes that they aren’t embarrassed to wear. In 2017, Moy and Sessions started collecting clothing donations. With the help of legions of volunteers, they have sorted and organized that haul by gender and size, ensuring that everything on the racks is clean and free of rips, holes, fading and stretching. Items are washed, pressed or steamed as needed. Moy says about a third of donated items don’t make the cut, but the rejects aren’t tossed; those pieces are passed along to textile recycling programs. 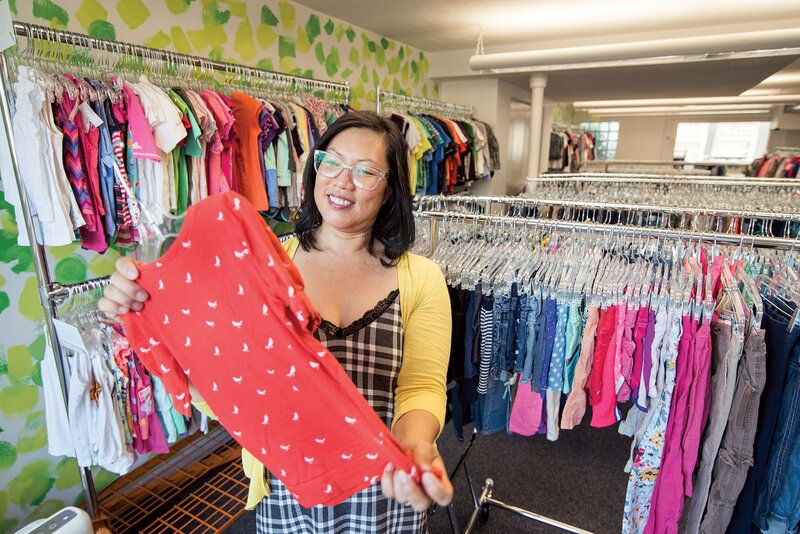 By the time The Clothesline opened this summer, the couple had amassed more than 4,000 pieces of apparel—including Vineyard Vines shirts, The North Face jackets, on-trend jeans and like-new shoes—all in sizes for kids from pre-K through high school. There are no price tags. Instead, The Clothesline works with schools and local nonprofits—such as the Arlington Partnership for Affordable Housing (which is also providing the retail space), A-SPAN and Doorways for Women and Families—to offer a need-based shopping experience for kids who might not otherwise have the means to afford a fresh wardrobe.